How Do People Really Use Text Editors? Our run of Der Freischütz at West Bay Opera concluded on Sunday. The innovative direction by Yuval Sharon had its fans and its detractors, but the singing was pretty well universally praised. As a member of the chorus, I was happy to see the critics’ response to our singing overall. San Francisco Classical Voice‘s Jeff Kaliss noted “the strength of the West Bay Opera choral ensemble.” Mort Levine from the Milpitas Post praised “the full-throated choral singing.” It’s nice to see reviews of the West Bay Opera chorus that don’t focus on how small it is. At 24 voices, the Der Freischütz chorus is as big as the company can put on the stage at the Lucie Stern Theatre. I’ve sung in several good choruses at West Bay, but this one was especially fine. I’d like to call our tenor section, pictured above, the “Kings of the High A’s” given the high tessitura of Weber’s tenor choral writing. Weber divides the tenor section three ways at times. Depending on which parts you are singing, you can go from 43 high A’s for a Tenor II to 94 high A’s for a Tenor I singing the Jäger part in Acts I and III. It’s demanding, especially for a 6-voice section, but I think we nailed it. 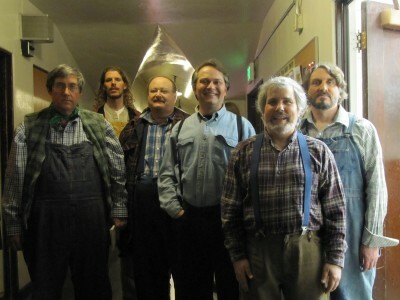 From left to right, that’s James Pintner, Alexander Frank, Thomas Ellison, Vincent Rubino, Michael Good, and Terry Hayes. We’re backstage at West Bay in our hunter / townsfolk attire. Thanks to fellow chorister Dee Baily for taking the picture. Our co-chorus masters were Hadley McCarroll and Bruce Olstad. It was thrilling singing and performing with everyone. Let’s do it again sometime! Now it’s on to my debut with the San Francisco Symphony Chorus in Mahler’s Resurrection Symphony. Jim and Tom are in the tenor section there as well. It’s quite something to be singing this work for the first time, in my first performance with this chorus, when at least 3/4 of the chorus have sung and recorded this symphony with MTT. (I’ll be on a more equal footing for the next program, featuring Swedish choral works that perhaps nobody else in the chorus has sung before either.) Performances are next week from March 11 to March 14 at Davies Symphony Hall in San Francisco. This entry was posted in Chorus, Music, Opera. Bookmark the permalink. This is a scary picture. It was a scary show! The Wolf's Glen scene portrayed Samiel as a werewolf, and included 7 dancing zombies – one for each bullet that had already found its mark. At least we didn't pose with our hunting rifles for this picture. The views expressed on this blog are mine alone and do not necessarily reflect the views of MakeMusic.